Mint or Pudina is a flavourful herb, is used in Indian Cuisine. Mint is a very healthy herb also. We make different varieties with this herb like rice, mint chutney, mint powder, mint water. Mint Rice is a very simple and easy dish. It is very flavourful and tasty dish best served with Onion Curd Chutney. Discard mint from the stems and wash thoroughly. Discard coriander also. Chop onions and slit green chillies. Combine mint and coriander leaves make smooth paste of it. Add 3 cups of water to rice, i.e. for one cup of rice add two cups of water, and pressure cook for three whistles. Heat oil in a kadai add cinnamon and cloves. When start spluttering add onions and green chillies. Fry them for a while. Once onions become translucent add mint and coriander paste. Mix well. Fry till the aroma of mint releases. Add salt and turmeric powder. Mix well. Now add cooked rice to it. Mix well so that all the mint paste mixes with all the rice grains properly. Saute for a while. That's all simple and tasty mint rice is ready to serve. 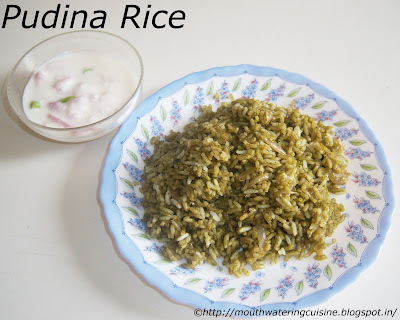 Serve mint rice with simple onion curd chutney.